According to Decree of the Council of Ministers of the USSR dd. 17th of December, year 1960, No. 165 it was made the resolution to build up Kramatorsk Castings and Forgings Plant as the basic enterprise for providing heavy machining industry plants with large size steel castings, forgings and welded blanks. 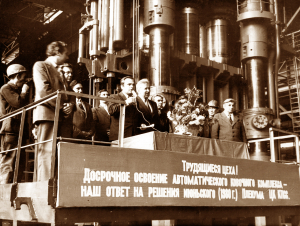 In July 1962 it was begun construction of the plant in accordance with the project of Ukrgiprotyazhmash approved by the decision of the former Donetsk Council of National Economy No. 111 dd. 23rd of December, year 1961. 29th of December, year 1964 it was commissioned the first stage of the block No. 4 (model shop and warehouses). It was put into operation the starting complex of block No. 1 (arc-furnace melting shop) as a part of the furnace, pouring and charge-holding bays with electric arc furnace DSP-50. Reconstruction of the plant in order to create production capacities for manufacturing blanks for the nuclear and hydropower. 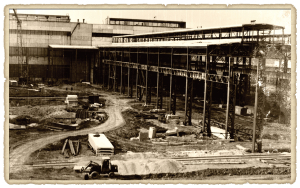 1978 – first millionth ton of steel was melted at the plant. 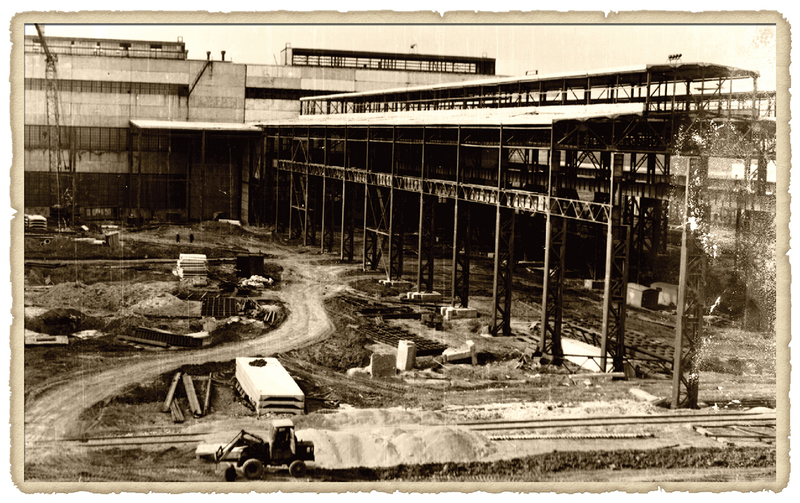 1980 – it was commissioned the complex of forging shop No. 1 for production of 30 thous. tons of forgings. In view of enterprise specialization in the manufacture of products for power engineering, according to the Order of the Minister power engineering dd. 06th of July 1979, the plant was renamed Kramatorsk Plant “Energomashspetsstal”. For the construction and commissioning of the first stage of the All-Union Komsomol construction project “Channel Dnieper – Donbass” it was shipped seven half-shells B-36324 for pump OPG-220G. The first stage of the Forging Shop-1 is put into operation and it is commissioned buildings of auxiliary shops with production capacity of 25.4 thous. sq. m.
It was delivered the first export order – parts of turbine for power plant at Democratic People’s Republic of Korea. 7th of August, 1982 it was commissioned an automated forging complex and press manipulator on the base of 15000 ton-force press. 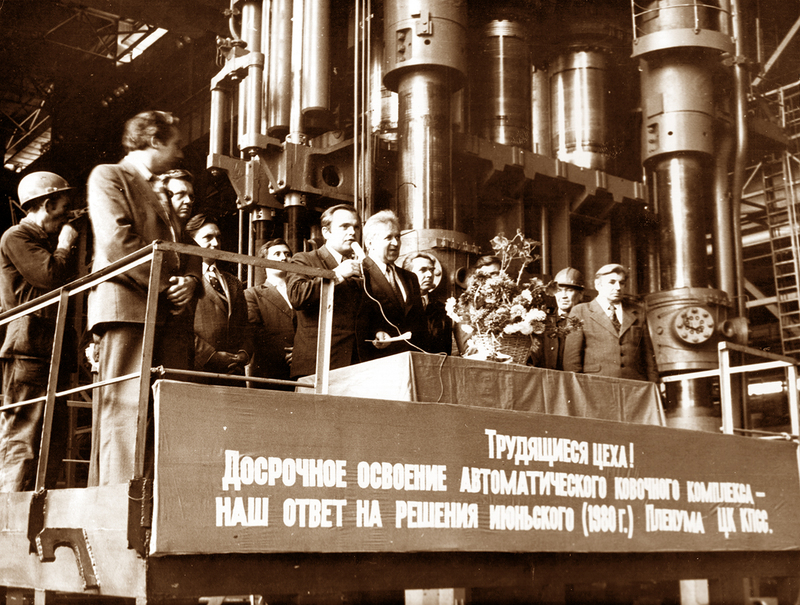 November 1985 – for the first time in the Soviet Union it was manufactured one-piece cylinder housing of the turbine-millionth for Balakovskaya NPS. The highest production capabilities of the plant: steel – 204 thous. ton; casting – 29 thous. ton; forgings – 73 thous. ton. – NPS (shells, blanks of bottoms). – In the thermal shop it was put into operation a new section of differential heat treatment of backup rolls of rolling mills. – On the Machine Builders Day the whole team festively celebrated 45th anniversary of the commissioning of the plant. The celebration was attended by partners of the plant from Ukraine, neighboring countries and beyond, and special attention of the company’s management was paid to the former directors of the plant. 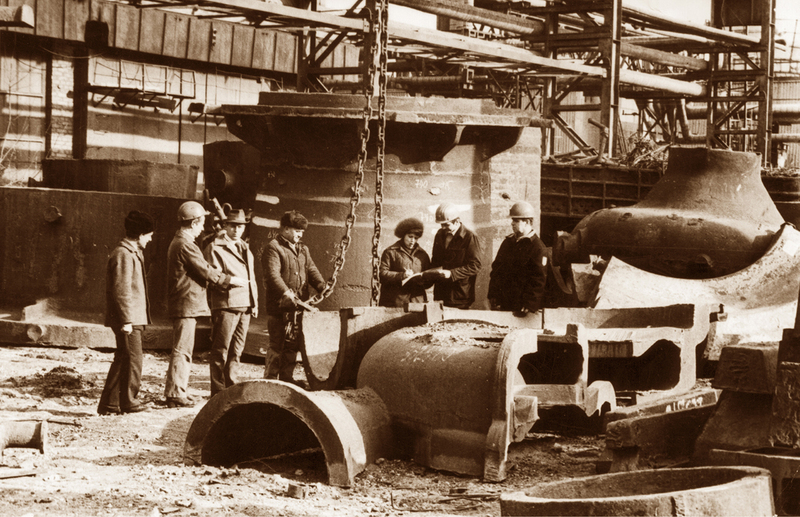 – in the thermal shop it was commissioned: bell-type furnaces designed for rolls preheating and tempering during AHT and rolls heating and tempering while improving, the installation for checking the high-pressure rotors for the thermal stability. – unique ingot weighing 355 tons was produced in the Arc-Furnace Melting Shop. – PJSC “EMSS” was included in the Engineering Division of the State Atomic Energy Corporation “Rosatom” – JSC “Atomenergomash”. – The first experimental cast hollow ingot weighing 69.6 tons was molded in the Arc-Furnace Melting Shop. – In the Foundry Shop it was implemented the furan cold-hardening mixtures and mastered the production of energy body casting of complex configuration. In CIS countries nobody produces such molded cases. – PJSC “EMSS” has successfully passed the certification for the right of products quality control for equipment of nuclear power stations. – In the Heat Treatment Shop it was commissioned the new vertical sprayer for large rotors hardening. – In Mechanical Treatment Shop it was installed and put into production the deep-boring machine model 110 FT.
– At the PAO “Energomashspetsstal” it was completed a seven-year production modernization program thanks to the support of the State Corporation “Rosatom” and its mechanical engineering division JSC “Atomenergomash”. The volume of investments in the modernization of EMSS exceeded 300 million dollars. Investments were aimed at complete upgrade of enterprise production base, including melting, forging and thermal, machining production. It was commissioned the new steelmaking complex DSP-70, which will allow melting 70 tons of metal every 55 minutes, and this is 3.5 times faster than at the existing equipment. – Production of one-piece shell of casing pipes of the nuclear reactor became the industrial achievement in 2012. Absence of pipes welding seams several times increases the strength values of the most critical part and, moreover, reduces the labor intensity and cost of the part, making it more competitive. – PJSC “EMSS” is fully integrated into the supply chain of products of nuclear island “Atomenergomash”. – At Energomashspetsstal first time in history of independent Ukraine it was casted a unique large-sized record ingot weighing 415 tons. Such ingot producing is a real technological breakthrough. Possibility of ingots casting of such scale – it is the open doors to the development of new types of products for the nuclear, metallurgical, petrochemical and other industries. – In the production of high-alloyed stainless steels it was introduced the vacuum oxygen decarburization of steel (VOD), allowing to increase the profitability of the products made from these steel grades, as well as significantly expand the range of high-alloyed steel grades. – For the first time in the history of the plant at the PJSC “Energomashspetsstal” it was produced hydraulic turbine impeller blade with a complete machining. After completing a full cycle of production of one of the most important elements of the “heart” of HPP, the company confirmed the policy to manufacture the products with high degree of machining. – PJSC “EMSS” is the first in Eastern Europe who has mastered the production of parts from hollow ingots. Advanced technology for manufacturing parts from hollow ingots will allow EMSS in the future to occupy the leading position among suppliers of products for high pressure vessels, providing the world’s highest quality requirements for products. This became possible thanks to an effective internal cooperation of two companies of engineering division of Rosatom: Energomashspetsstal and NPO “TSNIITMASH”. New technology allows significantly reducing the energy consumption and the number of production steps to manufacture the large steel ingots. At the EMSS it is manufactured the cylinders for compressors of gas and oil pipelines from hollow steel ingots weighing up to 121 tons. – At Energomashspetsstal it was executed the scale project for the production of backup roll for plate mill “5000” from the unique ingot weighing 415 tons. The roll ordered by JSC “Severstal” is also unique in itself: it weighs 255 tons. The successful implementation of this project allowed EMSS became one from the five largest plants in the world, who is able to produce such products. – PJSC “EMSS” got involved with the project of creation of new generation of nuclear-powered icebreaker. In the frames of project 22220 enterprises will manufacture 32 blanks of case equipment for two reactors RITM-200 with thermal capacity of 175 MW each for the world’s most powerful nuclear icebreaker LC-60 of new generation. – First time in the world specialists of EMSS produced bulk solid-forged blank of anvil for die hammer from ingot weighing 415 tons. Quality parameters of this solid-forged anvil are several times better than similar part obtained previously by electro slag welding. Delivered weight of the product was 195 tons. Anvil was shipped to the address of “Ural’skaya Kuznitsa”.